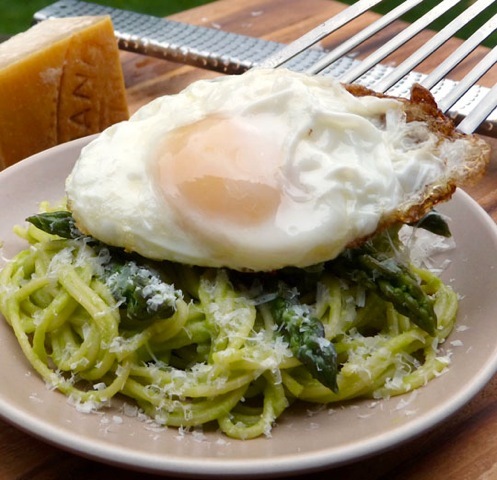 Pasta with asparagus and a fried egg. Photo by Donna Turner Ruhlman. I was about 24 hours into my vegan experiment, planning to prepare pasta with asparagus and olive oil. In Ruhlman’s Twenty, I write about what a felicitous pairing scallops and asparagus are and make a sauce by pureeing the stems and mounting the puree with butter, serving the reheated tips as garnish. Finding myself with a good bunch of asparagus, I thought, “I’ll bet pureed asparagus makes an excellent sauce for pasta. But still it’s going to need a little oomph. Hmmm. Perhaps some freshly grated Parmigiano-Reggiano. Oops, not strictly vegan. But maybe just a few shaving, it’ll taste sooo much better.” I was hungry, and the dish needed a little extra something, which in so many instances is solved simply by adding an egg. Oh hell, why not mount a good deal of butter into that beautiful pureed asparagus and top the plate with a chicken’s egg. Thus, my experiment in veganism came to a close with an absolutely fabulous, intensely asparagus-y pasta topped with more asparagus, cheese, and a fried egg. Worth every compromise. Looks like my own Ruhlman’s “twenty” will be sticking around for a while longer. The following recipe will serve two full portions or four starter courses. The eggs can be poached rather than fried if you wish. Cut off the asparagus tips, put them in a bowl, and cover with plastic wrap. Cut the stems into 1-inch pieces and puree them in a blender, adding just enough of the reserved cooking water to get the puree going. Transfer the puree to a small saucepan. Bring to a simmer, then swirl in the butter, keeping it moving till the butter is completely incorporated. Add a four-finger pinch of salt. Keep warm. Fry the eggs over high heat till the white is set, or cook as you wish. While the eggs are cooking, reheat the asparagus tips in a microwave (you might want to toss with a little olive oil or butter first). Toss however much pasta you feel like serving with the sauce till it’s evenly coated. Divide among plates. Grate cheese over each and top with the asparagus tips, followed by the egg. Crack pepper over the eggs and serve. My past post and video Guerrilla cooking demo—a weekday meal: Tomato Basil Pasta Using Tomato Water. Learn how to grow your own asparagus for next year. Here is a brief history of asparagus. Did you know that it is native to the eastern Mediterranean and Asia Minor areas? Know the origin of your Parmesan cheese. You’re doing veganism for health, right? I shudder to think what your non-diet menu looks like! Keep it up with the vegan diet! That is veganism I can get behind. The Wheat berry salad was great. This looks tallarin verde from Lima, Peru, eggs on everything! Just like my tries to go caffeine free…I´ll consider it in another life. How can you pass up such a sensational pasta? Oh yes, you don´t! I’m with you on that other life business. I’m too set in my loves to forgo these hard-earned pleasures. Looks wonderful. I think I know what I’m having for dinner with the last of my Ontario asparagus. on purpose! i like the crispy white on the soft pasta! Simple… elegant… satisfying. Will do this one soon. In my own kitchen, I’m always working with craving and utility–and I only give up something I really gut-love long enough to extract meaning. It sounds like the vegan experiment, like all contemplative cooking practices (and I consider you a great teacher in that realm), was useful to bring you right back where you live–circular, egglike–what you actually love to eat. Particular hunger pangs serve a purpose, and that’s how it is with craving once it gets into the stomach: “A sack was never so full but that it would hold another grain” (French proverb). You’ve said that there’s nothing you wouldn’t top with an egg, save dessert…Grits made with half and half and butter (which is the only way) are on the salty-sweet continuum–so I believe topping them with an egg may count as dessert–certainly, as the grain that broke the camel’s sack. All of your books are staples & very useful–but none as much as the most recent (thank you!). I think it’s the salt (and pepper) of pared-down wisdom–what actually works is what actually works (v. diet, ingredients). An unseasoned freshman fifteen couldn’t have written that–but a Ruhlman’s Twenty?–it was a natch hatch. Deep thanks (and I use it all the time)! I had different kind of pasta before so this pasta recipe looks interesting and delicious. I did not have a pasta with an egg before but I would not mind having an egg since I like egg recipes. Maybe it will be more interesting if I use the asparagus instead the usual celery and carrots in my pasta. I have learned many things from you and your website it is TRASURE for me every day i dive into your website sorry for my broken English. I have learned many things from you and your website it is treasure for me every morning I dive to your website sorry for my poor English . Remember that once you decided “pasta” you were already non-vegan unless it was a water-based and not egg-based noodle. If you really want to to do vegan, you gotta think South indian for the tastes and complexity you need. Otherwise you are looking for great food and finding only what seems like nuts and berries. What an interesting point about South Indian food. Is that the food from Kerala? This does look delicious. I make aglio olio a lot and often top it with coarse breadcrumbs toasted in a pan with olive oil and a fried egg. Since I have a flourishing asparagus bed upstate, when the asparagus is in season I like to eat a soft boiled egg for breakfast with lightly blanched asparagus that I dip into the egg yolk – with your toasted and buttered Best Homemade Bread made into soldiers*. By the way, I tried fresh duck eggs for the first time this week. Fabulous! I have Schmaltz on my iPad, but I will be buying the hardcover book too. I love the stock recipes in it. I am hoping you will write a whole book on stock and how to make it more accessible to the home kitchen. Schmaltz does that for chicken stock. I am so glad the vegan experiment came to an end. Nothing wrong with less meat or even no meat. But vegan takes us out of what makes us human. This looks like a very delicious and healthy pasta recipe. I’m curious at how the egg will affect the taste. My friend and I made this tonite for our occasional NRS (New Recipe Sunday) and holy cow was it fantastic. It didn’t even need the egg in my opinion (though we made them anyway). Next time, instead of a fried egg, I want to try adding just a room temp egg yolk to the top of the dish and letting the yolk coat the pasta.